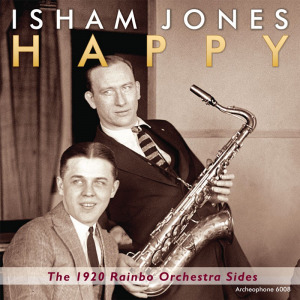 Years before writing "It Had to Be You," Isham Jones honed his craft at Mann's Rainbo Gardens in Chicagoâ€”composing, arranging, and perfecting songs that he and his band performed nightly before the dinner-and-dance patrons. Jones' style, capturing elements of the social dance craze of the 1910s and anticipating the jazz revolution of the 1920s, offers a rare glimpse into the beginnings of the era of great American dance bands. This two-CD set presents all 37 sides Jones' Rainbo Orchestra recorded in 1920 and includes a 32-page booklet, with notes by Grammy-nominated author and trombonist David Sager, exploring Isham's earliest years, his gift for tuneful arrangements, and his importance as an architect of the American dance band. Visit Happy's expanded catalogue page to see the complete track listing, read an extended description, and listen to sound samples.